The reception area ... light coloured finishes. THE Interiors Group has transformed a massive shell-and-core space on the lofty heights of the prestigious Etihad Towers in the UAE into an impressive 1,006-sq-m office for one of the world’s leading international financial consultancy firms. 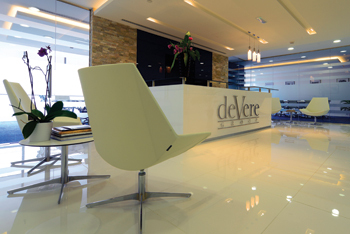 The UAE office of the leading UK-based interior fit-out firm was engaged by the deVere Group to recreate on the 27th level of Tower Three of Abu Dhabi’s iconic towers an office similar in look, feel and functionality to its Dubai office as well as to facilitate its expansion. From the initial meeting, the client stressed that the design concept should follow the look and feel of the recently completed Dubai office, according to a spokesperson for the Interiors Group. A subsequent visit to the office confirmed that the deVere corporate colours of dark blue and white had been predominantly used throughout the space. What Interiors Group has done is create a striking first impression right from the reception area, where a feature stone wall, with its stunning design, adds texture and depth to the space. 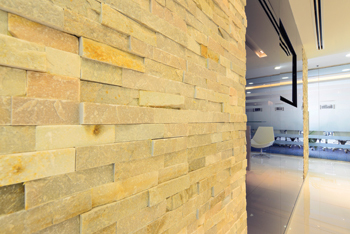 The stone wall feature in the reception area. The client’s brief to the Interiors Group for the rest of the floor was to fit out as many large team rooms as possible, so that each room could accommodate approximately 30 members of staff. The group has also fitted out a separate training room, plus print and breakout areas. Again, the corporate colours are reflected in this area with the furniture and fittings largely in white and the deVere blue juxtaposed with Interface Swing carpet and accent paint on the columns. Visitors to the office are greeted by a welcoming reception and client waiting area, which is easily accessible from the lift lobby nearby. The client also requested that the meeting rooms and management offices were to lead directly on from the reception area. “It was during this stage of the fit-out that the Interiors Group was presented with some challenges in terms of planning, as the lifts were situated in one of the narrowest areas of the oval floor-plate, however this was quickly resolved,” says the spokesperson. “Another challenge was that the position of the reception resulted in limited natural daylight. With this in mind, the finishes in this area were kept as light as possible, using white ceramic floors and furniture. A fresh, bright finish was created, with the corporate blue only introduced via the glass and stone feature wall behind the reception desk,” he adds. 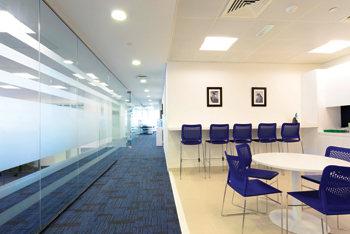 The main, open-plan part of the office is generally in royal blue, contrasted tastefully with a white background. The Interiors Group chose 12-mm-thick, tempered polished, frameless glass partitions, using powder-coated aluminium U channel fixings and joints filled with clear silicone. This attention to detail by the Interiors Group has created an unobstructed view between all the different areas of the office. The meeting rooms, conference room and private offices for the executives and directors and the rest of this floor area feature two-toned blue carpet tiles throughout. Leather executive upholstered chairs enhance the luxurious feel of the offices. The training room ... corporate colours reflected. The kitchen and breakout areas, with their glossy white units and royal blue splash backs and breakfast bar stools, are fresh and inviting. The furniture is from Humanspace (Icon range). The Interiors Group has offices in the UAE, Oman and Ireland. With over 27 years of experience, the company has delivered some stunning commercial environments. As a specialist in office refurbishments and fit-outs, it has a simple philosophy which is to exceed its customers’ expectations every time. “In fact, we care about everything that we do – if it matters to you, it matters to us,” says the spokesperson. “We are widely proven and trusted by both clients and professional project managers to deliver business environments on time and on budget,” he adds. The deVere Group has more than 80,000 clients in over 100 different countries, and over $10 billion of funds under its stewardship. Since its inception, the company has sought to grow and develop hand-in-hand with its clients, and as a result, has expanded its global presence to meet their requirements. The group helps its clients create, grow and safeguard their wealth in an extremely competitive international marketplace by offering them the best independent financial advice available on the market.